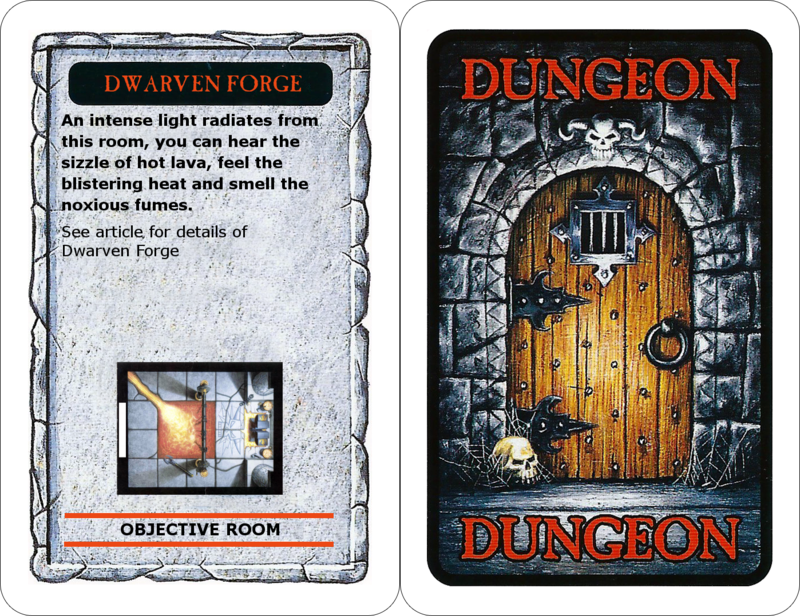 I’ve searched long and hard for a dungeon card to go with the dwarven anvil/forge that appeared in White Dwarf 200. In the end I though what the hey I’ll just make one instead. Below is my effort. As for rules well I haven’t given that much thought but here are a few ideas. The anvil is magically and imbues weapons made using it with random properties. The monsters that start in the room are all armed with magically imbued weapons, but the magic is weak and fades quickly (so you don’t get lots of magical equipment from it). Perhaps all the monsters in this dungeon cause more damage than normal because of their magical weapons. You could involve the lava but frankly if you’re an adventurer you’re survived this long you’re probably not going to stand in the hot stuff. Perhaps one of the party has foolishly put on a magical bracelet that will kill him if he can’t take it off and the only way is the break it on the anvil. Any comments or suggestions let me know. When I started work on this card I decided it would be a good idea to put together a tool so people could make up their own cards. To that end I created the Dungeon Card Maker, just enter a few details and upload a layout and there you have it, just download the new card, print it own and stick it to some card (some cheap playing cards will do, right thickness and shape).